Use your THB debit card anywhere that MasterCard is accepted. 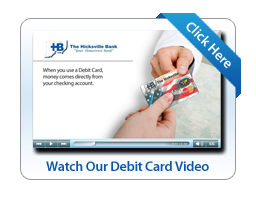 The Hicksville Bank's Debit MasterCard* can be used to make purchases anywhere MasterCard is accepted. You will no longer have to worry about running out of checks or carrying large amounts of cash. Purchases made with a Debit MasterCard are deducted from your checking account and will be reflected on your monthly statement. In addition to these great features, the Debit MasterCard can also be used as an ATM Card which eliminates the need to carry 2 cards. All the services provided with an ATM Card are available with the Debit MasterCard. *Available to qualified individuals with a Hicksville Bank checking account. The daily purchase and ATM cash limits are determined at the time of card issuance. The Hicksville Bank's ATM card provides the convenience of 24 hour banking and there are no fees to our customers when using our ATM's located at any of our branches. You can also access your accounts using other ATM's (fees apply). To apply for a Debit or ATM card, please visit any one of our branch locations.